Notes: To see if this item is available for pick in your area at no additional shipping cost, please click the following link: Find Store Location. NOTE: This option is only available for United States customers (excluding Alaska, Hawaii, California, Oregon & Washington). For additional information on picking the item up in store, please call (800) 664-1062. PLEASE CHECK FLAT RATE OR FREE SHIPPING (PICKUP) WHEN YOU CHECK OUT. THANK YOU. Shipping quotes are required when shipping to west coast states. There is no Free Shipping to west coast states including Arizona. Thank you. The unique and refreshing heavy duty dog crate design you've been waiting for is here. 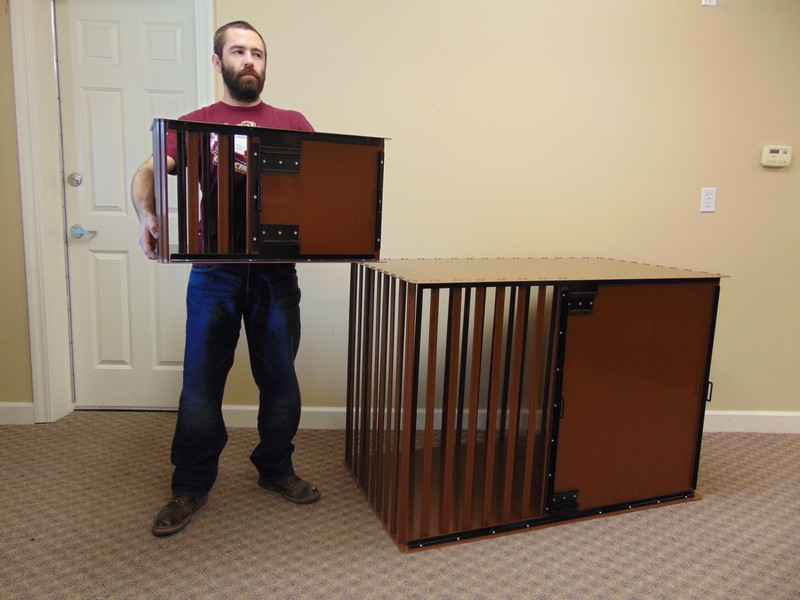 These new strongest crate models are changing the way we think about canine confinement. People that have dogs with separation anxiety or noise phobia need the most durable, sturdy dog crate able to withstand the constant pawing, pushing, pulling and chewing these types of dogs can do when left alone. 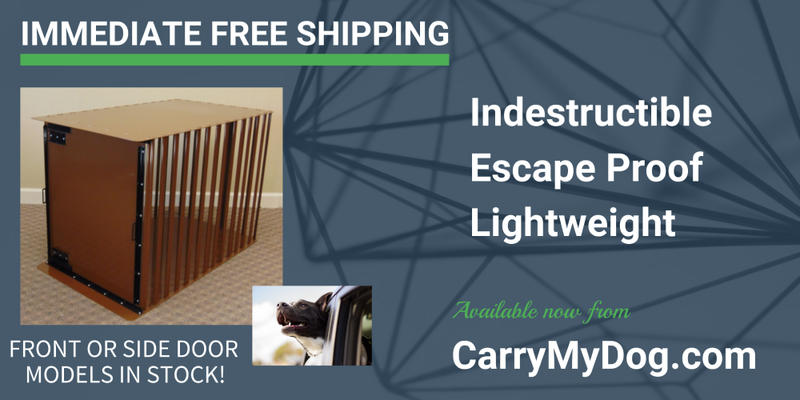 This new CMD crate from CarryMyDog.com offers the best of both worlds. 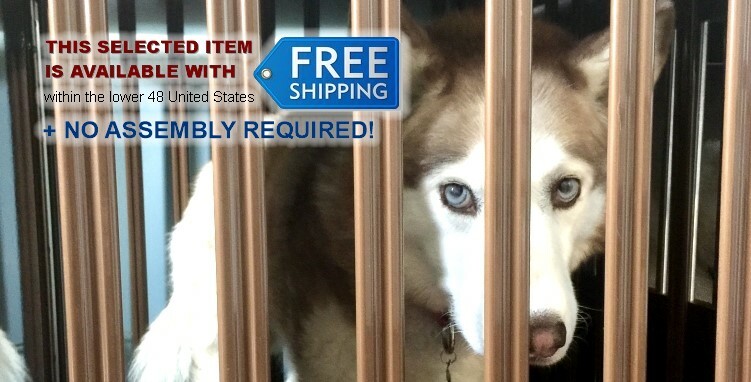 You have a lockable solid door that provides a bit of a den effect for your dog and, vertical bars for an excellent field of vision for you and your dog at home or in your vehicle. This new CMD heavy duty dog crate provides the strength you need with the elegant design you’ve been looking for in a sturdy dog crate. Have a close look at the photos and see our features list to get an idea of what this all-new strongest of crates has to offer. These make great transport crates too. In the back of an SUV, these heavy duty crates allow you to see your dog while traveling. Loading and unloading are easy with the solid sliding doors. It will be getting hot soon. These heavy-duty crates provide the best ventilation possible. We chose to offer five sizes that “stair step” up in size from one sized for toys up to relatively large dogs (not including the actual giants). Here's a quick way to understand the major reasons why you should buy a Composure Crate for your dog. Our design engineers decided to use only sliding doors because of their simplicity, inherent strength and the endless complaints about swinging doors used on most all dog crates. Our crates are specifically designed for “injury avoidance.” The interior has no sharp edges. Instead, you will find only smooth flat surfaces and smooth rounded edges. We believe that dogs are not exposed to anything that could cause a cut. In the process of designing for “injury avoidance,” we have created a high strength structure. We know of no way for a dog to damage, escape, let alone destroy one of our crates. A common complaint from dog crate purchasers has been the difficulty and time required to assemble their dog crates. Once again we have sidestepped a major problem. We only sell and ship our crates fully assembled and ready for use. There is a bit of a tradeoff, however. This tradeoff has made packaging and shipping more expensive. But from what we know, it appears most customers do appreciate being able to use their crate as soon as it comes through the door. There are no welded joints in any of our crates! 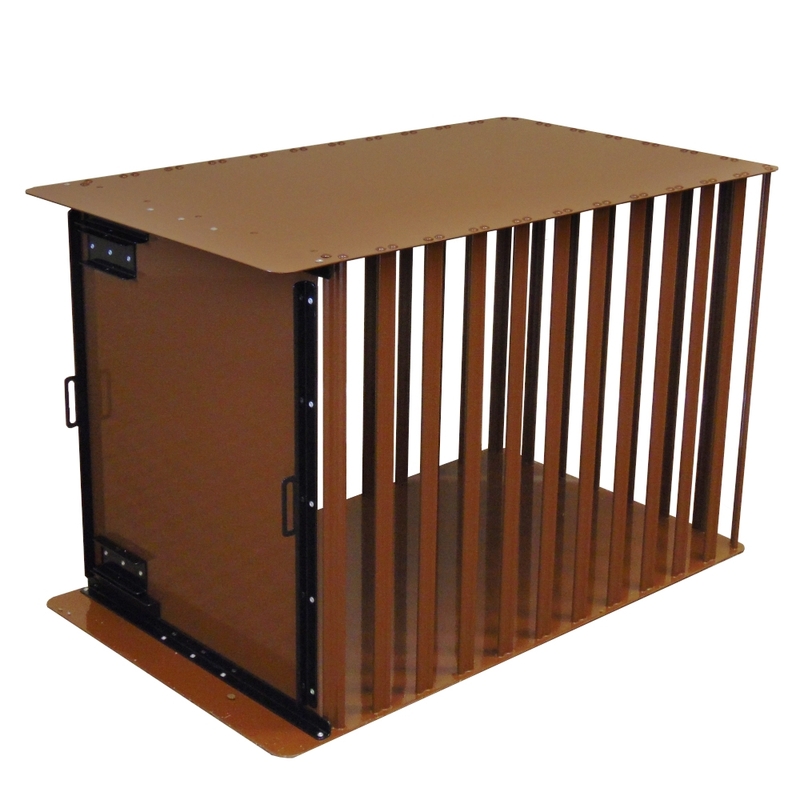 Two styles of heavy duty dog crates are available. One is the standard end loading crate. The other is the side entry crate. We are very proud of our front door model. Most dog crates have a swinging door on the front side. We have a sliding door on the front of the crate. One advantage of this layout is that an optional movable rear wall can be used when raising your puppy. The rear wall can be moved back in three-inch increments to accommodate growth. Thus the crate will always be the “right” size as the dog grows. The second heavy duty crate design has a sliding door located on the long side of the crate. Although our crates are intended to be stationary, it is possible to use the side door model while traveling in an SUV or van. By placing the crate crosswise in front of the vehicle’s rear door your dog can quickly enter and exit the crate through its side door. Remember, the door is facing out to the rear. The side door units are 3” longer than the front door version of the same model size. The doors on both crate styles slide to open. Our engineers felt that a sliding door would be easier, safer for your dog and, much better looking than the ever popular "slam latch" style door. More about these special doors later on this page. X-SMALL: 20 Lbs. X-SMALL: 18 Lbs. Here are some important points about the solid doors on these super-strong heavy duty crates. The door is a solid door. There are no bars or openings of any kind. With bars on three sides, you have a full view of your dog at all times. Your dog has a full view of everything going on around him or her. If you have a camera on your dog while you're away, this is the full-view open crate you want to use. If you want the door to open in the opposite direction, just turn the crate upside down! Why is the door size on a heavy duty dog crate important to the dog owner? The crate may be the correct size for your dog but, if the door is too small, the dog can hit his head or scrape his backbone when entering or exiting the crate. The doors on both crate models are only 3/4" less than the size of the crate itself. Loading and unloading are easier on both the dog and the owner. There is no need to step up and over any part of the door as the dog must do with some crates. With this crate, he or she just walks right in or out. This comes in handy when loading and unloading from the back of your SUV or truck. Locking the door on either model couldn't be easier. Once the door is closed, the holes will align. Just insert the door locking pin that came with your crate. It's that easy and, your dog will not be able to get the door open either. You may lock your door at the top or the bottom since locking holes are provided in both locations. This crate is escape proof and indestructible due to its design and materials used. A close look at the vertical bars shows a shape and thickness previously unseen in the industry. Along with the unique fastening system, these bars provide the strength you need with the looks you want. Unique extruded aluminum bars are the heart of these crates. The bars are permanently held in place by our exclusive proprietary high strength fastening system. These crates will deliver every time. 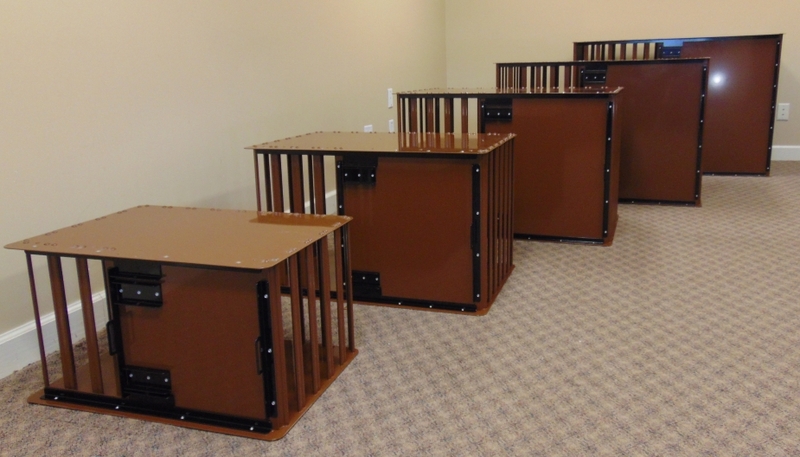 Bring your separation anxiety and noise phobic dogs and enjoy the strength and safety these crates have to offer. Note: It is standard for separation anxiety and noise phobic dogs to chew parts of their crates. We suggest a combination of training and a good supply of chews and toys inside the crate to help distract your dog from chewing their crate. The vertical bars are 1" wide and the airspace between the vertical bars is 2". There are all sorts of recommendations for dogs that like to chew on their crates. Be sure to have your dog's favorite toy inside the crate along with a favorite bed, pad or blanket. The proper toy filled with peanut butter or other "lickable" product is also helpful. Then there are those who swear by exercise. Everyone seems to agree that a tired dog is a happy dog. Just some food for thought. While some dogs are pushers or pullers, some are chewers. Some will chew until it hurts then stop. Some will chew through the pain. If you have a chewer, be sure to monitor his or her chewing in this or any other dog crate. Nobody knows your dog and what makes him or happy more than you do. 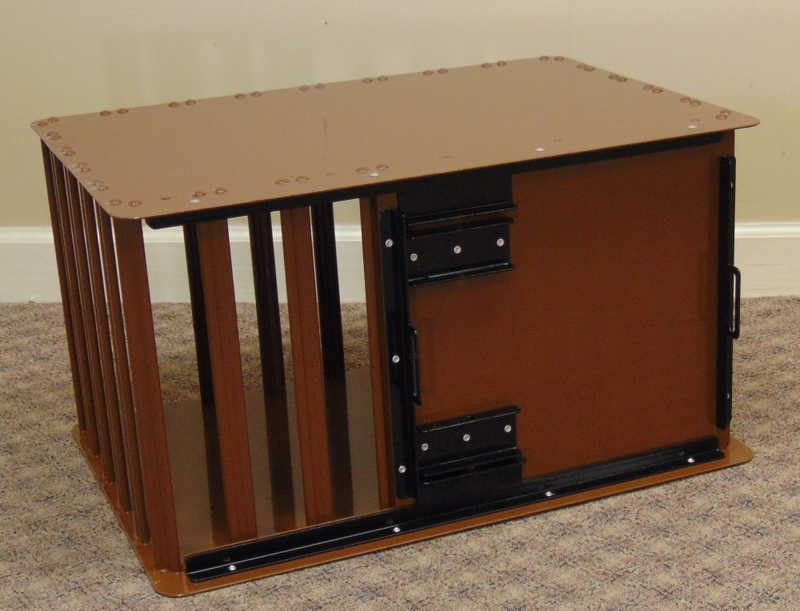 Our crates are powder coated a beautiful glossy Fawn Brown color. Some monitors may display different shades of any color. Please check with Google to see the actual color sample on your screen. Many dog owners get their dogs at around 8 weeks old. 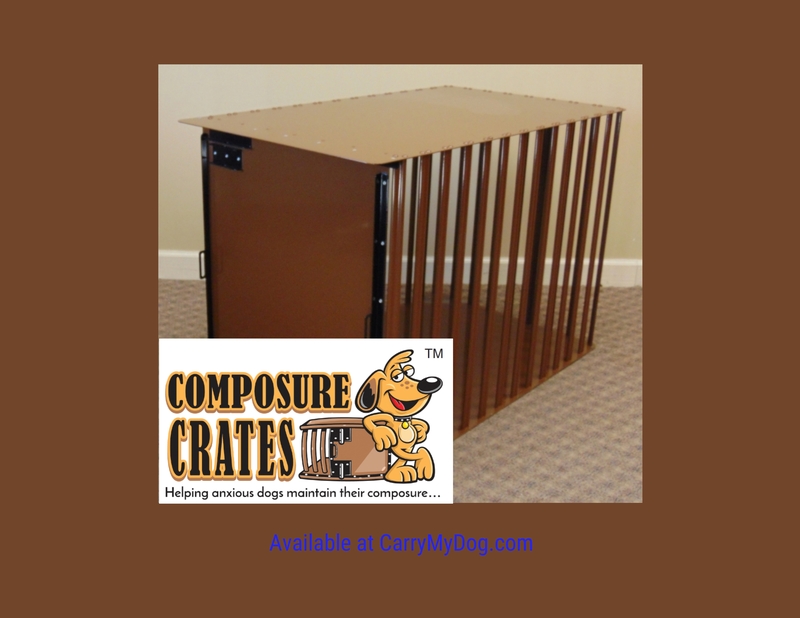 If you know you will be crating your new dog; then a Puppy Partition is in order. The Puppy Partition is an optional movable rear wall that can be moved as the puppy grows. This rear wall can be moved in 3-inch increments. Your crate will always always be the “right” size as your dog grows. 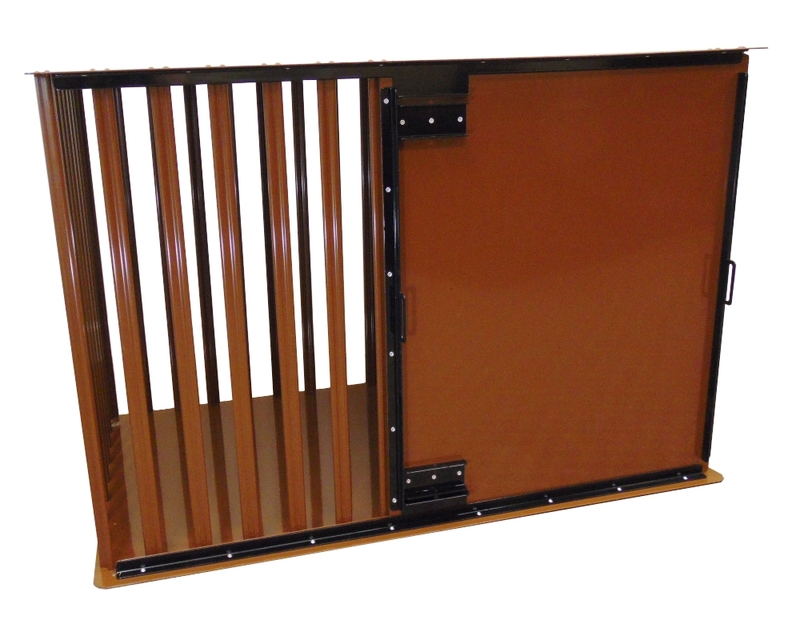 The partition is a color match to the dog crate and is sturdy powder-coated aluminum. The adjustment is quick and easy. Anyone of any age can move the partition. It is available with the front-loading heavy duty dog crate models only. The 3 smallest sizes are shipped via UPS or FedEx. The Large and the X-Large are shipped via LTL truck, palleted. Lead time: 24 hours up to 1 week subject to stock on hand. We currently ship to the lower contiguous 48 states only. Canada, Alaska, and Hawaii are in our future but not at this time. 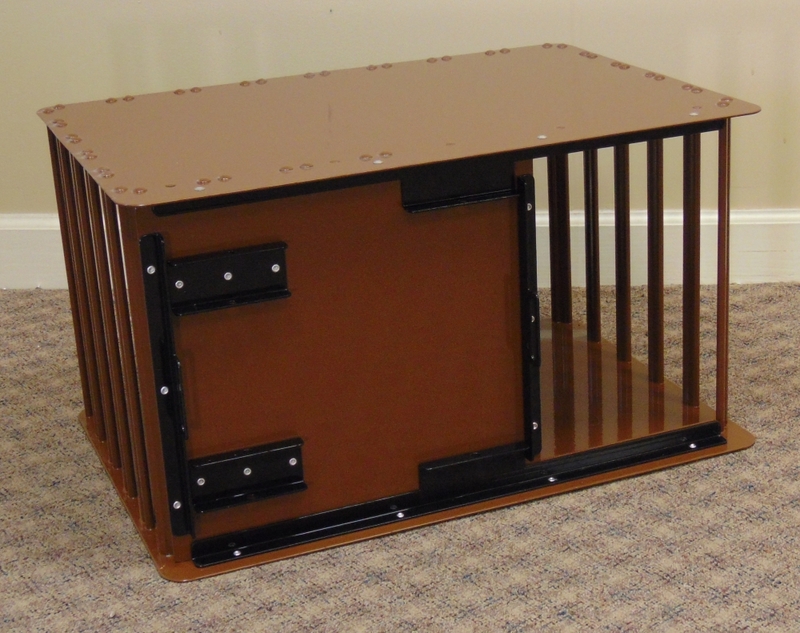 A few of Our Customers Talk about these great Heavy Duty Dog Crates. My dog, Andie, went through two crates before we stumbled upon the Strong Heavy Duty Dog Crate for Separation Anxiety Dogs. She had broken out of the other folding metal crates, harming herself in the process, and my wife and I knew we needed something more sturdy. The Strong Heavy Duty Dog Crate arrived in a giant box because it doesn't fold. It's a rock-solid crate made of billet aluminum that looks like a small tiger cage, and that's exactly what we needed. 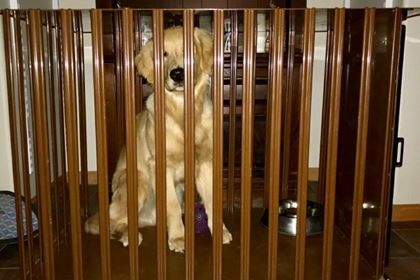 Andie has done her darndest to bite, claw, or otherwise bang her way out of the crate, and all of the bars have stood adamantine. She has actually wondered into the crate even when we're not leaving her in there, finding comfort inside of it when it's storming outside. Overall, it's a damn good product and was worth every penny we paid for it. We hate to have to leave our dog in the crate, but her separation anxiety prevents us from just leaving her in the house because she will destroy everything around her. 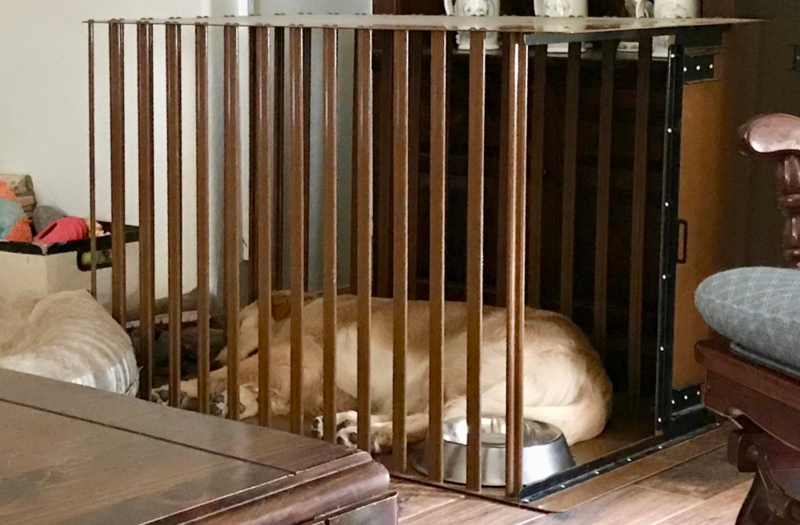 Though we are working with her every day--and she has come a long way--when we do have to leave her by herself, we're assured of her safety and well-being when we leave her in this crate. We've had it for a couple years now, and it's in the same great shape it was in when we first got it. Hi, Just wanted to send you a note of thanks for producing one of the best dog crates possible. we adopted a dog through our Arc of Mecosta rescue. She is a 5 year, brindle pit bull. A wonderful dog, well mannered and loving but has tremendous separation issues. We have had several crates that she has broken out of by biting the metal restraints, we kept going stronger, even to the point of using "pig fencing" all the way around the crate. to no avail. We were concerned that most crates had opening in the top, chewed through and saw a lot of injured dogs using those crates. Then we heard about your crate. Your crate has given us a new lease on our lovely Cali. It is built in a different fashion, having the sliding door, spring locks on the outside and the vertical bars. It is very easy to keep clean. She has plenty of room to see out but because the sliding door is solid she also has a corner to have privacy. She,of course, tried to bite the bars....to no avail and because there are no screw or metal pieces to get a hold of inside the crate cannot hurt herself chewing on them. Quite simply put. this crate is worth every penny paid for it. I had gone through 4 crates before I could not recommend any changes. It is much nicer looking than a "crate" can be used inside, can be moved easily. I honestly believe that if you have problems with your dog biting through, this is the crate for you. And incidentally, The builder also takes the utmost care in shipping your product. Give him a call and he will find the closest place to ship it. He will also give you a follow-up call to make sure everything is as you expected. You won't be sorry. Okie was able to escape from every kennel we had purchased previously. We were worried about his safety when he was trying to squeeze his way out of the kennels that were made of thin gauge wire. We needed a Crate that we could trust, something he could not escape. This Crate has been perfect for that, he also doesn’t mind hanging out inside of it, which he has never done before. The price tag proved to be worth it, as it will last a lifetime. It has certainly proved durable for our escape artist! We are so thankful to Bill from CarryMyDog.com for all of his help. Our dog "Bo" destroyed his last kennel so we needed something dog proof (Bo proof), and quickly. Bill helped us choose the right kennel and we love it. More importantly, our dog loves it. We were on the fence about the size but after remeasuring our dog, decided on the XL. From the photos it looks like a "L" would have been ok, but when Bo stands or sits, his head is only about 3 inches from the top. He is a leggy one. We had some questions about the manufacturing and availability so Bill actually put us in touch with the company that manufactures this kennel, and the owner, who we spoke with, was just as friendly and helpful as Bill. We placed the order on January 17th and it arrived on the 23rd, even with a delay due to a snow storm. The Kennel is made of all aluminum and is extremely well made. The workmanship is fantastic. We know our dog will be safely kept in his new kennel. There are no sharp edges and it is extremely strong. We just want to give both Bill and Darrel a huge thanks. First, thank you so much for getting the crate to us so quickly. We ordered on a Monday, and it was delivered to Fastenal by Friday afternoon. There was a slight hiccup when my husband arrived at the store to pick it up, but it was resolved pretty quickly once the girl who normally handles these types of deliveries arrived back in the office. FYI, the packing material the crate arrived in was huge, and took up every inch of space in the back of our truck. We ordered the large, so if anyone is looking at that size or larger, make sure your vehicle can hold it. Our escape artist has tried several times (based on the teeth marks on the bars) to chew her way out of the crate, but it’s holding up, and I think she’s finally come to the same conclusion. My husband did have to modify the crate because, as one of the previous reviews stated, the bars are too far apart, and doggie paws can very easily fit though them. He had to make a trip to Lowe’s to find something to create a barrier along the bottom of the crate because she destroyed two rugs before we could come up with a solution. See attached pictures for reference. The crate is very sturdy, and we know she’s not getting out of this one, but if you have an opportunity to make a suggestion to the manufacturer, I would recommend having them create something similar to what my husband did. There’s just too much room between the bars, and there’s a lot of potential for destruction from inside the crate unless you put it on concrete. She still isn’t crazy about going in the crate, but as long as I load her up with toys and a peanut butter Kong she’ll go in on her own. My husband and I feel much better knowing that she’s safe in her crate while we’re at work, and we no longer have to worry about coming home to Hurricane Roxy. The crate is fantastic! It's been a slow process getting Savi used to it but now she goes in and lays down and or naps in there on her own. She loves her crate too! At first, she ate her bed. The next time she actually chewed the arm of the rattan sofa about 2 1/2 " away from her crate-ignoring the peanut butter filled Kong that was in the crate with her. The third time (still only going to the next door cottage so I could hear her) I moved her 6" away from everything. She barked the whole time 1 hour. The next time I left her she barked for 1/2 hour. The third time 15 mins and now just a couple of barks. I just started leaving her in the crate and leaving the premises. She seems totally fine and most importantly safe! Here are some photos you may post if you'd like! She barked the whole time 1 hour. The next time I left her she barked for 1/2 hour. The third time 15 mins and now just a couple of barks. I just started leaving her in the crate and leaving the premises. She seems totally fine and most importantly safe! Here are some photos you may post if you'd like! Thank you again for caring and following up and doing a fabulous job educating me on the crates as well as arranging delivery with Fastenal. They were fabulous too. They carefully unpackaged the crate so I could easily get it through customs. It was in perfect condition. All the dog owner said was "One-of-a-kind-shot" and they were right. This is one of a kind. The occupant looks pretty relaxed to me. We hear this from most of the folks that have purchased this style of crate. They report that after a couple of days the dog seems very calm and happy in the new crate. Maybe it's the fact that the dog can see all around that makes the difference. We'll know someday but until then, just know that people that own this crate seem very happy with how their dogs take to it. "This was the first time he did this!" I've had this crate for couple weeks now, and I'd give it 4 out of 5 stars. I got it because my dog escaped from his wire crate and I needed something more sturdy. He has not escaped this Crate so far and seems to like spending some time in the crate even without being told to go in. I like that the top and bottom are solid. I can put things on top of it without my dog pulling them into the crate and chewing them. The size is perfect. Other crates with the same height & length dimensions are a couple inches narrower in width. I think my dog enjoys being able extend his legs all the way when he's laying on his side in this one. This crate is much more visually appealing than most crates. You can have the crate more open if your dog prefers, or put it in a corner for a more den-like atmosphere. The door design is really nice. It's almost impossible for a dog to break out. The door doesn't get in the way when open (if you get the side entry door). He seems to be giving up on chewing the bars now. Hopefully soon he'll stop completely. If your dog is a "chewer" you might want to get a crate with smaller vent holes to prevent any tooth damage. It's easy for dog to lose their toys/bones through the bars. There's no lip or anything at the bottom to hold things in. Price: $700 is a lot more than I wanted to spend. I could get a pretty nice bicycle for that price which to me seems more difficult to build than a crate. Myha lives in Virginia. Her owner just received Myha's new crate today. It is a Large Side Entry crate. Her owner reports that so far, Myha, while a bit uncertain, does like her new heavy duty crate. Good Morning Bill, The Kennel has now been in use for 12 days, and I thought it was a good point for an update. In the first week, I only noted 2 "breakout" attempts the first is the one I had already told you about where she chewed on the bars as well to try to break out. The second came later in the week where she attempted to see if she could weaken the bars from their base by 'digging.' All I could see on camera was her front leg/paw repeatedly coming out as she tried to see if there was a weakness to be found (she learns fast and isn't fond of pain, so she kept her mouth out of it this time). With the security of the kennel and composure doses on days where I know there are thunderstorms or demolitions training/exhibitions scheduled she has found comfort (overall) in her Kennel. It is almost nightly that I have to convince her to come to bed as she wants to just sleep in her kennel for at least a portion of the evening (she isn't trustworthy enough to roam - I have video proof of that). With the rise of finding her passed out in her kennel the combination of this morning finding her waiting impatiently at the bottom of the stairs for me to take her up and tuck her in for the day, I am more confident in saying the kennel has won her over (for the record Isis was already in her kennel - that has always been her safe place). Thanks again for the recommendation and have a great day! The crate has been good so far. Our dog still has the separation anxiety so taking a photo with the door closed wouldn't be good but here is one we've taken recently. Thank you in advance for becoming a CarryMyDog.com customer. You can trust us to meet and exceed your heavy duty dog crate needs, every time, all the time!